Rumble / Dogs & Puppies - What’s your worst nightmare when it comes to food? For some people, it is uncooked food, for someone who is waiting for their food for hours, but for us is sharing our food. You know how they say sharing is caring, but for us, that rule doesn’t apply. If you want to eat, get your food. This protesting dog feels the same as we do, he really does not like sharing his food with anybody, and when somebody tries to take his food, he howls in protest because he really does not like when people touch his food or even worse tries to eat it! What a nightmare. 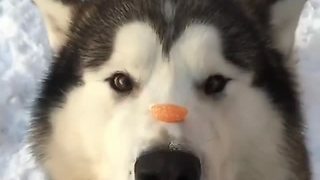 Take a look at this adorable video and this mad and slightly hungry Alaskan Malamute. 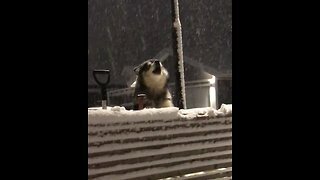 Whatever you do, do not get between this dog and his food! 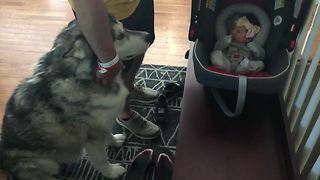 Dude, the Alaskan Malamute, goes over to this baby girl&apos;s high chair to see what food scraps he can find, but then realizes she is crawling toward his food bowl to eat his food. He is not so sure about that! “Get your own food hooman, don’t try to eat mine” we believe that he is trying to say. What a hilarious moment caught on camera. Dogs will share food with other dogs. Okay, maybe your dog doesn’t show this tendency at home enough for you to believe it, but in laboratory settings, it happens. Believe it or not, some dogs love to share food, but that is not something really common. There is no doubt that dogs love food. They will give everything just to get their paws on some food, and when they have it, they are not ready to share it with anyone. Dogs are always determined to get their paws on something they like, and when they get man oh man, what a delight is that for them. 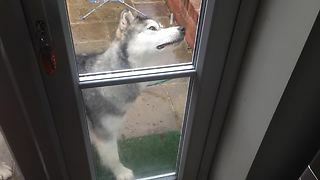 Dogs have been found to be very stubborn when it comes down to getting what they want, and what they want is to eat their food all alone without no one bothering them and not stealing their food. 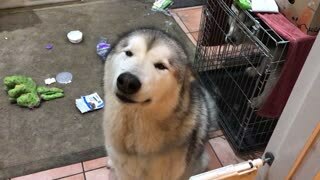 Overall, underneath all that fur and the muscle where the Alaskan Malamute is a very gentle soul. 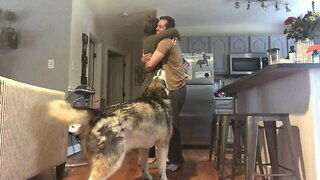 This video is another proof that dogs are the most hilarious creatures in the world! What if you stand on this, do you like to share your food with someone or not? Tell us below in our comment section!